Warm Up Hellfest Tour is soon coming for 14 dates all through France, with an unseen set and Dagoba will join the party! We're extremely excited to announce the next European tour! New album "BlACK NOVA" out now. The "Stone Ocean" video is finally out ! Click on the picture to listen to the 1st single "Inner Sun"
"Inner Sun", the 1st single of the new Dagoba's album "Black Nova", release on August, 25th. On August 25th, 2017, French metal force DAGOBA will release its seventh studio album, “Black Nova”, as a cooperation of Jive/Epic for France and Century Media for the rest of the world. Formed in 1997 and inspired by 90's American metal greats such as Pantera, Machine Head and Fear Factory, DAGOBA quickly expanded their furious sound with dark, symphonic and industrial elements culminating on what is to become their strongest album to date, “Black Nova”. Shawter – singer, guitarist, composer and leader of DAGOBA – helmed the recordings of “Black Nova”, which took place at Eagle Black, his own studio in Marseille, whereas Jacob Hansen (Volbeat, Epica, Heaven Shall Burn) took care of mix and mastering. “Black Nova” sounds massive with rich dynamics, towering riffs, vigorous shouts and infectious melodic choruses all over the place. The equally powerful artwork was created by Seth Siro Anton (Septic Flesh). The first single "Inner Sun" premieres on Rock Hard France's sampler CD out this week – "Inner Sun" will be available everywhere on May 19th. Known as an impressive live act, DAGOBA are about to set sails for Japan in May with full European touring under way right around time of release of “Black Nova”. Stay tuned for further details in the coming weeks! "We are proud to announce our signing with Jive Epic France / Sony Music Entertainment for the upcoming album ! More info will follow in the next months. Dagoba is going higher. We are stronger than ever and we are really grateful for your loyalty. Thank you !" « We're announcing today the departure of FRANKY COSTANZA and Z Dagoba from Dagoba for professional disagreement. We wish them all the best with whatever the future may bring. We will never forget the important roles they played in this band and the incredible moments we shared together. Its now time to re-energize the band with two new members in the Dagoba army. So please welcome JL Ducroiset on guitars and Nicolas Bastos Official on drums (video teaser for you below) ! Both guys will join us on tour in June to finish our 'Tales Of the Black Dawn' Tour (list below) with some gigs with Apocalyptica and the mighty Wacken Open Air Festival. 25/11/2015 - DAGOBA, Nantes : sold out ! The DAGOBA's Nantes show : sold out! This month don't miss Dagoba at Le ferrailleur ! 10/04/2014 - Welcome to DAGOBA ! DAGOBA joins RAGE TOUR ! Verycords is proud to announce the signature of DAGOBA for the international release of ?Post Mortem Nihil Est? . The selected partners for the rest of the world are: Ear Music/Edel for Europe and Japan , and eOne for The USA. ?Post Mortem Nihil Est? will thus benefit from a worldwide release, it?ll be out in France on May 27th and mid-June in the rest of the world. In July 2012, Izakar announced his will to quit the band, he is replaced since then by Z (The Coyotes Dessert, ex- Where Eagles Dare, ex- Caedes). The band is now finally ready to record the successor of ?Poseidon?! Recorded and mixed by Logan Mader (Ex-Machine Head, and famous producer), the 11 tracks of ?Post Mortem Nihil Est? will leave you knocked-out with its blast beats, growl voices and sharp guitars, and the melody in Shawter?s voice will haunt your mind for days! DAGOBA is back with the fury of the Greek god Poseidon, through this album which is a journey aboard a pirate ship, each song is a devastating one-stop spot on the globe. This attack is a real coming back to their roots and main influences with a more primitive and more percussive music, but also in the sound approach. Back in the studio with Dave Chang, who had attended the first eponymous album. DAGOBA is going to conquer new horizons, new warfields with its evil trident. "Face the Colossus"! Behold this giant fighting machine. Hear the mighty humming of its powerful engines. Feel the ground shake which each new step this monster takes. Fear its massive armament. Delight in the glorious beauty of this marvellous titan. DAGOBA have excelled themselves with "Face the Colossus"! On their third album, the French come crushing down like a ten-ton hammer. DAGOBA unleash the full fury of their fast and furious riffing crossbred with a pounding groove and surprisingly emotional passages. Their new songs are full of feelings, but never fall down into the whiny attitude of fashionable Emocore. DAGOBA chose to combine the revolutionary spirit of their hometown Marseilles with the attitude of Modern Metal. They expand on the theme of sheer force, which DAGOBA had already adopted in their early songs that still revealed influences like Pantera, Machine Head and Fear Factory as well as Death and Black Metal. It took DAGOBA only six years to rise into the leading ranks of New French Metal. Their claim for the throne is now only contested in friendly competition by Gojira. When vocalist Shawter decided in September 2000 to revamp the line-up of his old band due to a lack of motivation from the others despite having gained an opening slot for Rammstein, he was looking for musicians with ambition, talent and dedication. Luckily it did not take him long to find hard-hitting drummer Franky, a miracle in precision. Pounding bass-man Werther joined as well as riff-machine Izakar on guitars. Bursting of creativity, the newly born DAGOBA released their first 6-track EP in November 2001 and quickly gained recognition by the media all over Europe. With the aim of "turning violence into energy and emotion", the French recorded their self-titled debut early in 2003. With the mixing done by Dave Chang (Stampin' Ground, Linea 77, Orange Goblin) at Philia Studios in Oxford "Dagoba" took the metal-world by storm. The fierce dynamics and stainless riffing of the quartet surprised fans and press alike with Rock Sound summing up the consensus in one phrase: "DAGOBA crushes everything and leaves no one alive!" Following up on their instant success, DAGOBA embarked on an extended tour that took them out on the road nonstop from August 2003 until December 2004. Of the many highlights on this journey, the opening slots for Machine Head in Brussels and Fear Factory in Amsterdam are standing out. Thousands of people gathered at the Dour Festival in Belgium (2004) to see DAGOBA perform with only one album released. Having met with fast success, the French were ready for the next big steps in their career. In 2005, DAGOBA signed a deal with Season of Mist just before opening for Korn in Southern France. With the intention to intensify and enlarge their sound, the band chose famed producer Tue Madsen (Mnemic, Hatesphere, The Haunted) for their next recording. The Dane immediately sensed DAGOBA's originality and regarded them as "special" and able to catch his "attention from the first moment with their very well played and very dramatic material". When "What Hell Is About" hit the shops early 2006, the album turned quickly into a bestseller. Press results were even more raving than for their previous release. 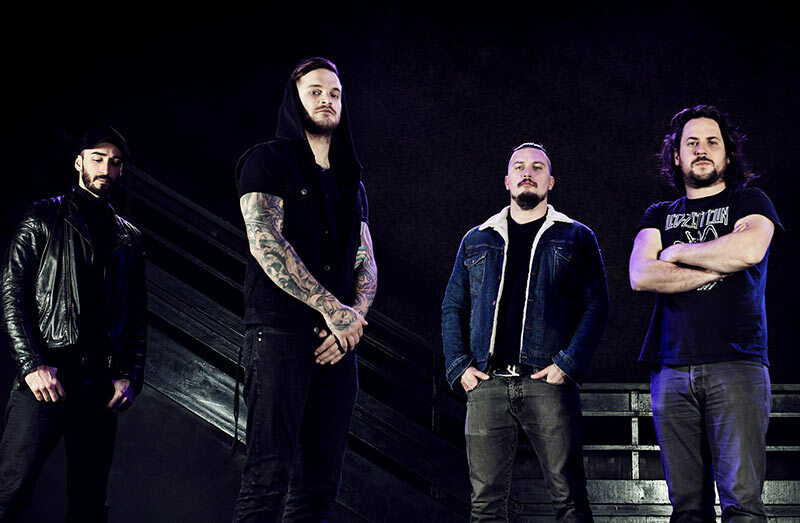 Backed by fans and praise alike, DAGOBA were invited to perform at many major European festivals and to play before the legendary Metallica of whom the French are big fans themselves. "What Hell Is About" set the course for the band's future. They had honed their skills as musicians to perfection, developed a heavily organic sound of their own and proved to be brilliant songwriters. Not content with their enviable position in the fast growing new wave of French Metal the band decided to collaborate once again with renowned producer Tue Madsen for ?Face the Colossus?. As a close-knit team, DAGOBA and Tue created an even more monstrously massive, but still clear and crisp sound that was adapted for each song individually.